Having a great time strolling down memory lane (CRACKED as it is) reading through Volumes 1 & 2 of Mark Arnold’s comprehensive “If You’re CRACKED You’re Happy” books while reading through the old mazagines at the same time. Once I get through them both I’ll post some more comments and post a few of the things I did for CRACKED near the end of their historic run. 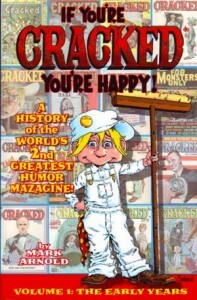 I’ll probably say this on subsequent posts but people give Cracked such a hard time and can’t say enough about how much it sucked but for a magazine to last for fifty years, someone had to be buying it. And not just the monthly issues, they put out tons of Collectors Editions, Giant-Sized, Super-Sized etc. etc. so if it was really that bad it would have folded. I just think people either don’t like to admit they liked it or like to tow the party line and jump on the MAD bandwagon. Yes, MAD was good but CRACKED had it’s own thing going on which really appealed to me. And who can forget their goofy marginal sayings like “CRACKED is mailing a dime to Siberia because you want to see a little money go a long way” Ba-dum-bump-tsshhhh!!! Love it!!! Long live Cracked!!! The world’s humorest funny mazagine!!!! This entry was posted in Gag Cartoons & Comic Strips and tagged comics, CRACKED Magazine, sequential art. Bookmark the permalink.